Can the Permanent Members of the Security Council Lead the World’s Journey to Sustainable Peace and Gender Justice? Since the adoption of the United Nations Security Council Resolution 1325 (2000), the world has slowly come to understand that the women, peace and security (WPS) agenda has transformative potential to create positive change. The WPS agenda is a tool for moving from conflict, militarization, and violence, to peace, inclusive decision-making, and gender justice, while increasing the number of women meaningfully involved in decision-making processes. However, this important tool remains under-utilized. 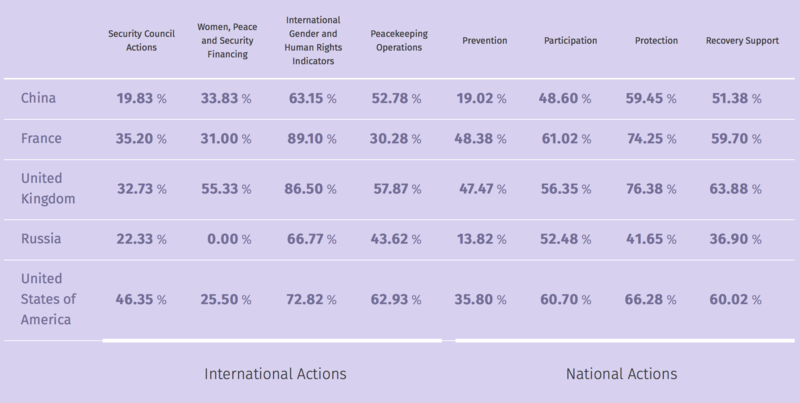 Innovative new research carried out through the WPS Scorecard project identifies several gaps in the holistic implementation of the agenda, especially in the areas of conflict prevention, demilitarization, and disarmament. In the wake of Donald Trump’s inauguration, now is an ideal time to reflect on these major gaps in the WPS agenda’s implementation, and promote advocacy and action amongst the grassroots. Civil society has an important role to play in ensuring that women’s rights are not used as a bargaining tool to solve other social, economic and national security problems. Considering their position as leaders on peace and security issues within the UN, the Permanent Five members of the Security Council (the US, Russia, France, China, and the UK) have a singular responsibility to implement the WPS agenda and set a precedent. Yet, as the world’s top military spenders and arms-traders, these states tend to prioritize their own geopolitical interests at the expense of the gender-sensitive agenda for peace and conflict resolution. 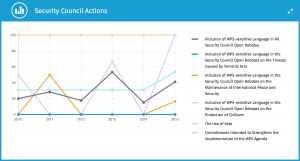 To date, verbal commitments made by the representatives of these countries at the Security Council’s Chamber have not translated into effective actions, with many efforts largely gender-blind to the context-specific needs of conflict-affected populations. For instance, the sale of arms by states including the United Kingdom and France, have promoted gender-based violence in Yemen through the Saudi-Arabia-led military intervention, and through these attacks, have directly violated women’s rights to adequate housing, health, and education. Moreover, where Russia and China failed to develop their National Action Plans (NAPs) on the implementation of the WPS agenda, the United States, France and the United Kingdom made their plans ineffective by failing to include necessary disarmament provisions and provide the necessary and sustainable allocated budget. The Permanent Five are missing the opportunity to internalize the WPS agenda within the Security Council’s daily work, on all country and thematic topics. Between 2010 and 2015, the Permanent Five used gender-specific language in 31.62% of all Security Council open debates. The Permanent Five generally do not connect or acknowledge the mutually reinforcing nature of women’s participation and protection, thus creating a false dichotomy that claims women’s protection issues are separate from, and more important than, issues related to women’s active participation. The lack of attention to gender-sensitive issues leads to more explicit consequences. As the continuous references to women as victims builds a dominant political narrative within the Security Council, diplomats tend to ignore women’s diverse and important roles in conflict resolution, peace building, and diplomacy. An example of such ignorance is the ongoing lack of human rights mandates and gender advisers in peacekeeping missions around the world. The Permanent Five are also failing to prioritize political economies of gender justice and peace by implementing structural changes within national security policies and budgeting. Between 2010 and 2015, the Permanent Five members spent 7 trillion USD combined on national military and defense, earning 124 billion USD from the transfer of arms sales. During the same period, the members only invested 172 million USD in the work of UN Women, and other spending allocated to WPS and gender-related issues remained inconsistent. With these trends remaining identical today, the numbers clearly demonstrate that the current state of international affairs is fostering war rather than cultivating peace and justice. The commitment to the holistic implementation of the WPS agenda remains illusory within the Permanent Five’s national environments. Instead, the Permanent Five are limiting the space for civil society, and failing to provide them proper funding and support. Restrictive NGO-laws, limited funding sources, and questionable criminal charges against activists have been authorized by the Permanent Five in the name of national security, with the aim of limiting civil society’s ability to operate effectively. 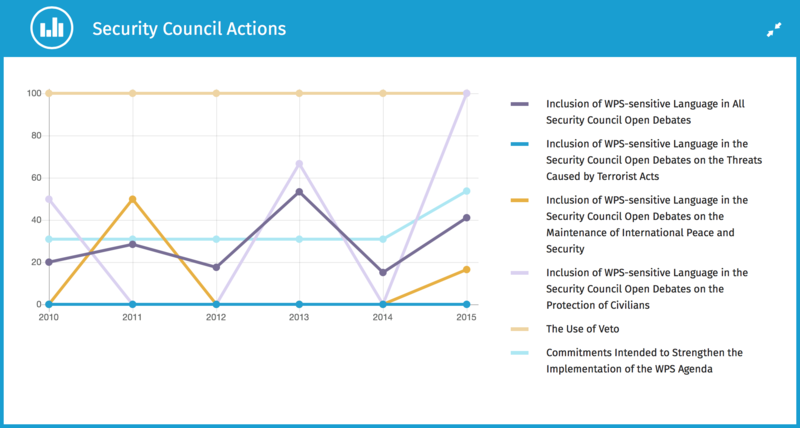 The graph depicting commitments to the WPS agenda within the Security Council actions. As the Permanent Five have yet to demonstrate a positive example of integrating the WPS agenda into national priorities, they should realize that their actions matter. Looking forward, as long as the leading countries at the Security Council remain represented by Donald Trump, Vladimir Putin, Xi Jinping, Theresa May, and, potentially, Marine Le Pen, the agenda is under the even bigger threat of being forgotten, or disassociated from national and international security efforts. Given the current leadership’s track record within the Security Council, it is evident that changes must be made. Non-Permanent Members should take over leadership of the Council, with a nuanced understanding of the importance of internalizing the WPS agenda within the Council’s daily work on all country situations and thematic issues, including counterterrorism efforts and the protection of civilians. Civil society actors and Member States should collaborate to develop specific commitments to meaningfully support the active and meaningful integration of women with a diversity of voices, experiences, and perspectives. To help achieve these ideals, UN Women should actively attend all relevant high-level inter-agency forums on peace and security. The establishment of an independent monitoring mechanism that is designed and operated exclusively by women’s civil society groups and women’s human rights defenders should be established to track the compliance of the Permanent Five and the actions of the Security Council overall. The Council must recognize the valuable knowledge, insight, and experience that civil society organizations have at the local level, and work with these groups as partners to achieve relevant goals. It must be recognized that the current leadership of the Security Council has prioritized greater spending on war, at the expense of promoting peace and conflict resolution, including supporting women and minority groups. With this realization, it is essential to raise the voices of civil society through influential platforms worldwide. With the support of diverse social and political leaders, we must ensure that all Member States of the United Nations work closely with civil society organizations to provide the WPS agenda with global support for the purpose of achieving sustainable peace based on gender justice and human rights. Marina Kumskova is a graduate student in Human Rights Studies at Columbia University and a research assistant at the Center for International Human Rights at John Jay College. In her research, she focuses on religious discrimination in the context of counter-terrorism policies. Katie Krueger is a Program Associate at WI-HER, LLC (Women Influencing Health, Education, and Rule of Law). She holds an M.A. in International Public Policy and Development, specializing in Human Security, Human Rights, and Gender Equity from the Middlebury Institute of International Studies at Monterey.